This section provides updates on progress we are making with our various developments. Keep checking back for more updates! 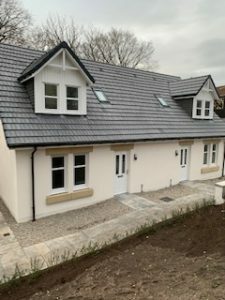 Albyn are delighted to announce that we have taken handover of 10 homes at Allen Gardens, Dornoch on the 11th February 2019. 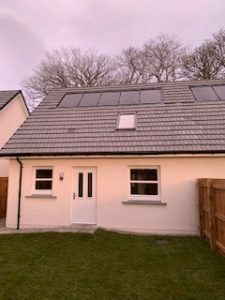 There are 8 houses for social rent and 2 for sale through the LIFT scheme. 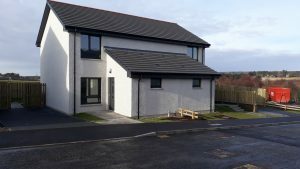 This was a Design & Build project with Springfield Ltd.
We are currently on site building 9 units for social rent and 2 units for Mid Market Rent as part of a Design & Build project with Pat Munro Homes Ltd. 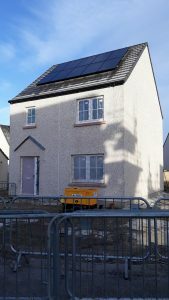 These are due to handover in Spring 2019. 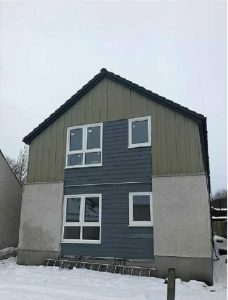 Construction is well underway in Grantown on Spey for the construction of 4 flats, there will be 2 for social rent and 2 for Mid-Market Rent. 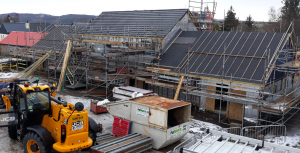 The photo below show the current progress on site, completion is due Spring 2019. 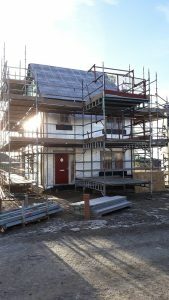 Compass Building & Construction are working on the development at Dalmore for 24 homes for social rent with a further 4 homes for Mid Market Rent. 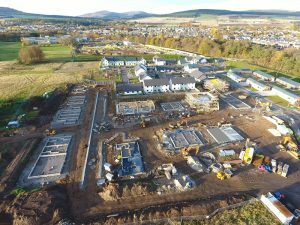 This project is due to complete in Autumn 2019, the photo below is a view of the site from above, this project is a continuation of previous phases completed at the Dalmore site in Alness. We are currently on site at Stratton, Inverness with Barratts building 42 flats. There are 30 x 2 bed/3 person flats and 6 x 1 bed / 2 person flats for social rent. There is also a further 6 x 2 bed / 3 person flats available to buy through the LIFT scheme. This phase is due to be completed by Autumn 2019. 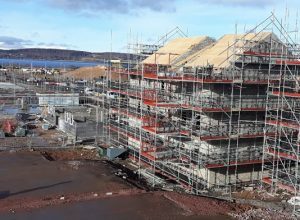 49 homes are currently under construction at Balvonie, Inverness with Bancon Construction. This site will contain a mix of 4 homes for sale through the LIFT scheme, 9 homes available for Mid – Market Rent and 36 homes for social rent. This project is due to complete Winter 2019. Construction is underway at Ardgay for 2 x 2 bed 4 person units for Mid Market Rent and 1 x 2bed 3 person and 1 x 2 bed 4 person units for social rent. The contractor is Compass Building & Construction and this is a Traditional Build project. This project is due to complete in late Spring 2019.